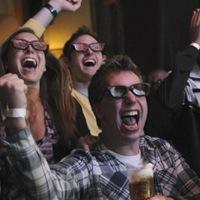 So when you’ve got your friends over to watch the game in 3D, keep the beer in the fridge. There’s no one pushing 3D harder than Samsung, at least until James Cameron comes back to the spotlight again for the 3D home video release of 'Avatar.' But even Samsung wants to make sure you’re using 3D safely. You can view the full list on Samsung's site via the link below, but here are a few of the more interesting precautions. First off, the site says not to use 3D while under the influence of alcohol. It’s an odd warning considering LG has installed their 3D sets into pubs across the UK. It’s also odd considering Samsung’s been pushing 3D soccer as one of the main attractions. And while not all sports fans are beer drinkers, the two do tend to go hand in hand. So fine, you’re up watching TV and you’re not drinking. You also shouldn’t be too tired, according to Samsung. The warning strictly says that those who are sleep deprived should stay away from 3D. The same goes with the elderly and pregnant women. Why? Samsung doesn’t say. And of course, Samsung recommends that you consult a medical specialist immediately if you start to feel lightheaded, dizzy, nauseated, or disoriented while watching content in 3D.